"Roberts, a lawyer and sociology professor, examines the development and contemporary consequences of "race as a political system," bringing science, law, commerce, and race ideologies, virtual thickets of controversy, under one canopy. After demonstrating how, historically, "race was literally manufactured by law," and offering an admirably intelligible account of genomic theory, she considers the extent to which the new approaches "tend to merely repackage race as a genetic category rather than replace it." DNA becomes a "marketable commodity," one consequence being that "race soon became the linchpin for turning the vision of tomorrow's personalized medicine into today's profit-making drugs." As she assesses the "new biopolitics of race," she argues that "Race-based medicine gives people a morally acceptable reason to hold onto their belief in intrinsic racial difference." While "pharmacogenomics," "epigenetic," and "allele" are not in most of our conversations, and while the specialized journals Roberts has made germane use of, for support or to controvert, are not most readers' regular stuff, Roberts is consistently lucid. Her book is alarming but not alarmist, controversial but evidential, impassioned but rational." “Race, like Freddy Krueger, keeps coming back after we believe we kill it. In this masterful book Roberts cogently shows that race has been rearticulated in perhaps more pernicious ways in medicine, biotechnology, and social policies. 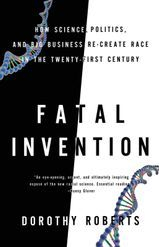 A terribly important book on how the ‘fatal invention’ has terrifying effects in the post-genomic, ‘post-racial’ era.” © Eduardo Bonilla-Silva, professor of sociology, Duke University, author of Racism Without Racists. © David Satcher, MD, PhD, Director, Satcher Health Leadership Institute, Director, Center of Excellence on Health Disparities, and 16th Surgeon General of the United States. “Dorothy Roberts’s Fatal Invention is a significant contribution to our understanding of how and why there has been a resurgence of the idea of ‘race as biological’ in the twenty-first century. This book provides a comprehensive and astute analysis that gives new meaning to the idea of ‘co-production’—by carefully piecing together and then explaining how clinical medicine, corporate pharmaceutical interests, and the political science of human molecular genetics have joined forces to resuscitate and legitimize a contested eighteenth-century framework for categorizing humans.” © Troy Duster, Silver Professor of Sociology, New York University, and author of Backdoor to Eugenics.